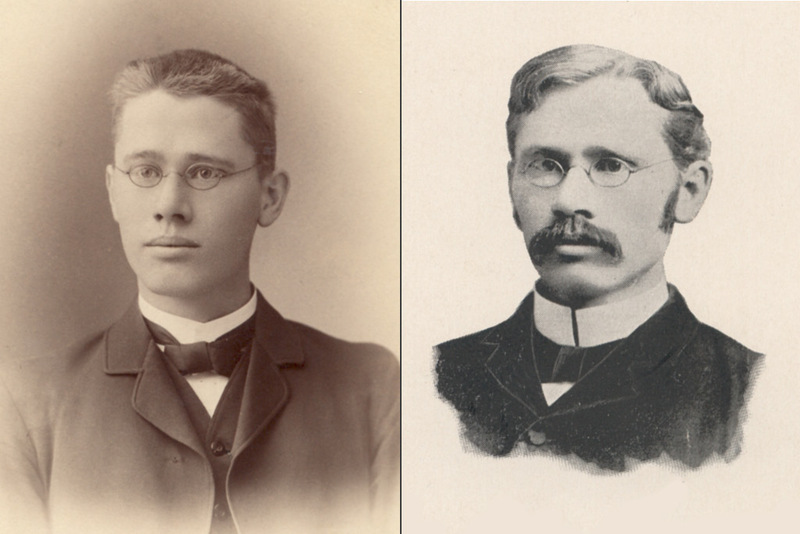 Edward Kremers in 1886, the year he earned his undergraduate degree from the UW Department of Pharmacy (left), and Kremers circa 1895, as a young professor in the Department of Pharmacy. The name “Kremers” probably sounds familiar—but unless you’re a University of Wisconsin–Madison School of Pharmacy history buff, or you listen intently during Dean Steve Swanson’s introduction of one the School’s prominent lecture series, you might not recall why. Edward Kremers, whose legacy lives in the Kremers Lecture series that promotes leadership and excellence in pharmacy education, was the second director of the University of Wisconsin’s Department of Pharmacy. Despite meeting heavy opposition, Kremers introduced the world to a four-year degree in pharmacy, changing the course of the profession’s educational standards from the foundations to what would become the UW–Madison School of Pharmacy. To enhance and deepen both the practice and understanding of pharmacy, Kremers also continuously pushed for the inclusion of humanities and history in pharmacists’ education. Ultimately, his forward thinking would influence the future of the profession by carefully remembering the past, collected and held within the walls of the UW–Madison School of Pharmacy. “In our utilitarian and materialistic age, too little attention is given to history even in the academic courses of our colleges and universities,” declared 27-year-old Kremers, then director of the University of Wisconsin Department of Pharmacy. He was presenting a paper, “The Study of Materia Medica,” at the 1892 meeting of the American Pharmaceutical Association (APhA), providing a wide-ranging critique of the current state of pharmacy education. Edward Kremers in front of an exhibit of historical pharmacopoeias put together by the UW Department of Pharmacy at the annual American Medical Association convention in Milwaukee in June 1933. Kremers’ early and ground-breaking interest in the humanistic and historical aspects of pharmacy established the University of Wisconsin’s longstanding commitment to the study and preservation of the history of pharmacy. Born in Milwaukee in 1865 to German immigrants, Kremers attended a German-style “Gymnasium” for high school and then apprenticed at a local German-style Apotheke. In addition to studying at the Philadelphia College of Pharmacy, Kremers earned his undergraduate degree in pharmacy from the UW Department of Pharmacy and then received his PhD from the University of Göttingen. Kremers’ primary goal was to improve the quality of pharmacy education at the University of Wisconsin and around the country. He strongly believed in raising the level of the pharmacy curriculum to match the quality of instruction in other disciplines on campus, and he wanted to fully integrate the Department of Pharmacy and pharmacy students into the larger university. 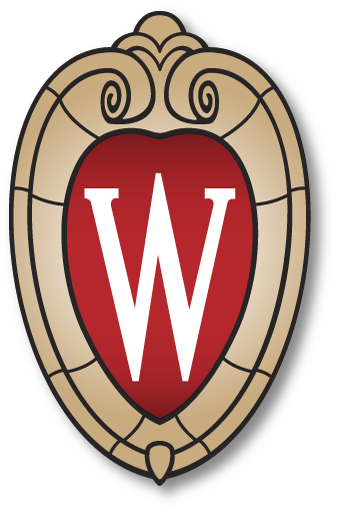 By 1932, the four-year pharmacy course pioneered by Kremers at the University of Wisconsin had become the national standard. Over the rest of the decade, Kremers’ ideas won more acceptance. By the end of the 19th century, several public institutions, including Michigan, Kansas, Purdue, and Auburn had followed Wisconsin’s example and introduced elective four-year courses in pharmacy, and many of the old-line private colleges of pharmacy began seeking affiliations with nearby colleges and universities to provide more well-rounded educations. By 1932, the four-year pharmacy course pioneered by Kremers at the University of Wisconsin had become the national standard. During the early 20th century, Kremers focused more attention on his particular interest in the history of pharmacy. 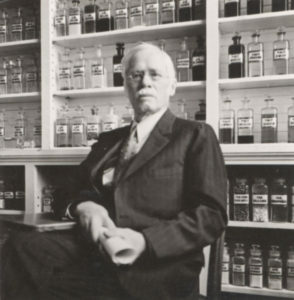 He was a driving force behind the founding of the American Pharmaceutical Association’s Historical Pharmacy section in 1904, and he was instrumental in locating, gathering, and preserving archival records and other materials for the benefit of future historians. Edward Kremers sits in front of glass drug bottles in 1938. In 1907, Kremers introduced, for the first time anywhere in the United States, an elective class about the history of pharmacy. Since the introduction of this groundbreaking course, the UW–Madison School of Pharmacy has continuously offered its students a class about the history of the profession. Kremers corresponded widely about his interest in the history of pharmacy, and, in the late 1930s, he played a critical role in bringing George Urdang to Wisconsin. A well-known editor of pharmaceutical journals and historian of German pharmacy, Urdang was a Jewish refugee from Nazi Germany, and his arrival and collaboration with Kremers in Madison helped spur the publication of the groundbreaking book, History of Pharmacy. On January 22, 1941, Kremers, Urdang, and four other colleagues founded the American Institute of the History of Pharmacy (AIHP). Five of the six AIHP founders were associated with the UW–Madison School of Pharmacy, and, ever since, AIHP and the School have enjoyed a close and collaborative partnership dedicated to maintaining and enhancing Kremers’s lifelong work in promoting and preserving the history of pharmacy. Six months after participating in the establishment of AIHP, Kremers died in Madison at the age of 76. Kremers’s voluminous correspondence and meticulous research notes now form the core of the Kremers Reference Files, an important historical research collection maintained by AIHP and the UW–Madison School of Pharmacy. Today, Kremers’s legacy lives on in the School of Pharmacy and AIHP’s joint commitment to preserving and studying the humanistic and historical aspects of pharmacy practice, and utilizing that insight to push pharmacy forward. Ever prescient, Kremers in 1911 anticipated the expanded role of pharmacists and knew that the profession would go beyond dispensing. Learn more about the American Institute of the History of Pharmacy.